The beautiful Mo'chedda stuns in a Miskay boutique outfit, a white top and denim skirt. Quite a lovely street style inspiration for your weekend look and I bet you will not regret it. 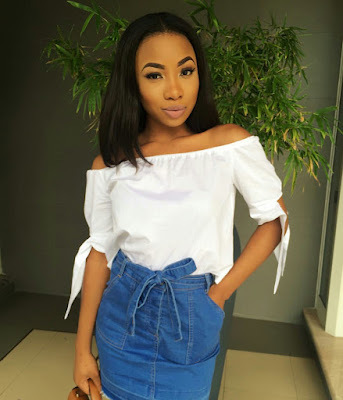 A white top has become the best pair for any denim skirt or pants, then completing it with any colour popping shoe and bag ends up bringing out the magic in that look. But rocking the outfit with shoe and bag colours like black, white and brown is not a bad idea as well. More lovely photos after the cut..